The Sun Poker management team has been in the online gaming industry since 1997. 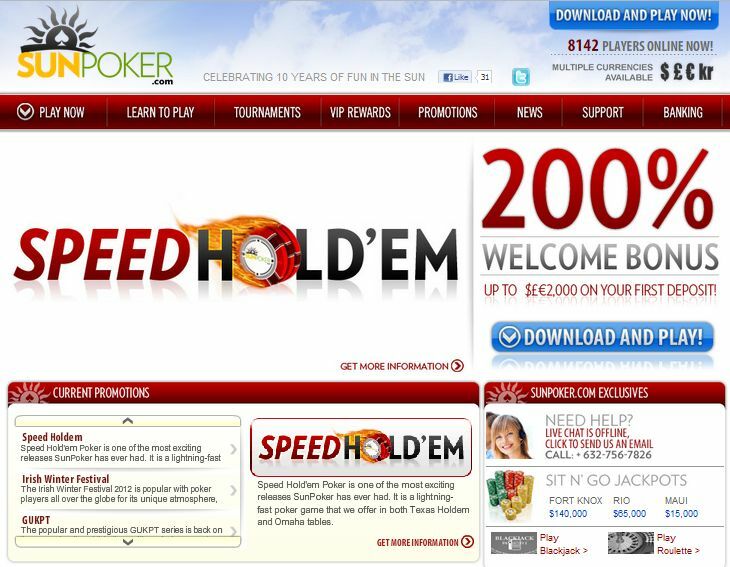 The poker room itself was launched in 2001. It offers a good variety of poker games and worthwhile bonuses and promotions, as well as an excellent selection of tournaments to take part in. Sun Poker is part of the iPoker Network and is powered by the iPoker software. The software is available in English, German and Russian. The software provides information for players who are new to the game with a glossary, poker etiquette and poker basics. You can choose from a number of poker variations when playing at Sun Poker. These include Texas hold’em, Omaha, Omaha hi-low and 7 card stud. There are plenty of tournaments hosted at Sun Poker every month with the poker room guaranteeing $4 million in prizes every month. They guarantee payment of $400,000 every weekend. Tournament types include single hand and multi hand events, with short handed sit and go tournaments, as well as turbo events. Players can participate in sit and go tournaments, jackpot sit and go tournaments, guaranteed prize pool tournaments, freerolls and satellite tournaments. There are also add-on and re-buy tournaments. Sun Poker offers multiple exciting bonuses and promotions to its customers. New players are eligible for a 100% match deposit bonus up to $500. During your first month at Sun Poker you will also be eligible to enter their $1,000 VIP tournaments. If you refer a friend to Sun Poker you and your friend will both be eligible for a $100 bonus when your friend makes their first deposit. You can take part in the $12,500 “Double Dip” cash race in two $6,250 races. You can join one of five ways to win tickets to the 2010 WSOP in Las Vegas. From May 24 to June 6, Sun Poker is hosting the $4.5 million guaranteed sixth European Championship of Online Poker (ECOOP). Also, from May 14 to May 23 they are hosting the mini ECOOP IV – a $600,000 guaranteed event. Sun Poker runs a five tier loyalty program with levels Mars, Earth, Venus, Mercury and Sun. Players earn points for every bet that they place and these points, once accumulated, can be converted to cash. Members of the loyalty program are awarded cash prizes and special promotions depending on their level. 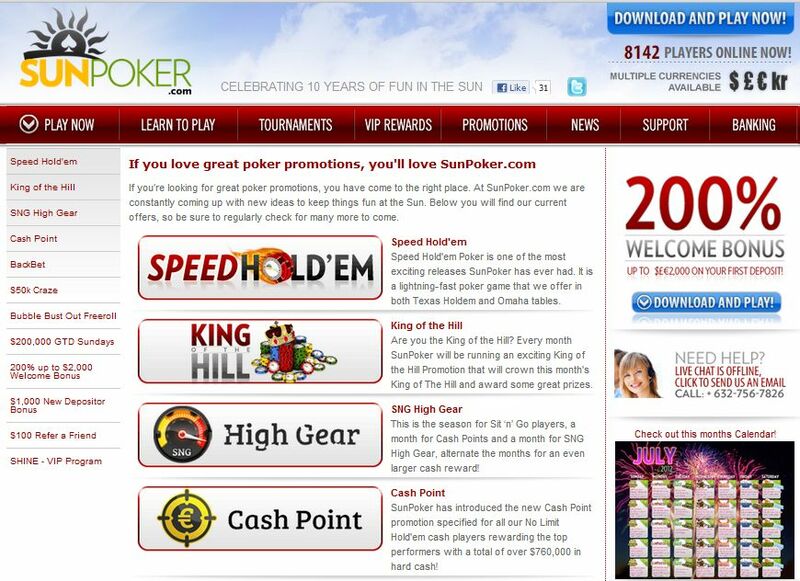 If you have any questions when playing at Sun Poker you can access the FAQ section on their website. This section contains the answers to many general questions. If you do not find the answer to your question here, you can contact customer service support which is available 24 hours a day, seven days a week. They can be contacted via email, telephone or fax. Instant live chat is available from 12:00 to 2:00 GMT every day. You can make deposits into your Sun Poker account via a number of safe and convenient methods. These include VISA, Master Card, Click2Pay, NETeller, Ukash, EntroPay, VISA Electron, Delta, Moneybookers, Wire Card, bank transfer, Paysafe Card or WebMoney. What is the best place to play free online slots and cards, and which ones have actual prizes?